Alaskan Malamutes have strong, big-boned, wolf-like frames covered in soft double-thick coats. Their wide heads have rounded skulls, large muzzles, triangular ears and black noses. They have almond-shaped eyes with a wolf-like but kind and curious expression. Their strong, slightly arched necks slope down to strong backs and plumed tails that curl over the back. Their coats are dense and thick, and they usually come in solids or various combinations of white, gray, sable, red and black. 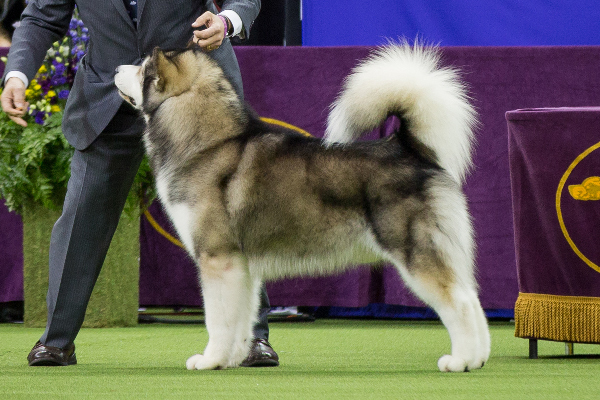 Overall, Alaskan Malamutes carry themselves with dignity and power. Alaskan Malamute. Photography by Kayla Bertagnolli, as captured at the 2018 Westminster Kennel Club Dog Show. Alaskan Malamutes may look like lone wolves, but they could not be more fun, playful and friendly. They love to goof around, play games and be rowdy (in a pleasant way, of course). As Alaskan Malamutes mature they do become more mellow and easygoing, but they never really lose touch with their inner-puppy. Take them outside on any given day and they’ll frolic with the best of them. These dogs seem to get along with everybody—even other dogs. They are very pleasant and open-minded, allowing everyone the benefit of the doubt. Aside from their intimidating looks, they have no real guard-dogging qualities. Alaskan Malamute. Photography by Darina Matasova/Shutterstock. As you can tell by looking at them, Alaskan Malamutes prefer cooler temperatures. If you happen to live in a warmer area, keep your Malamute in the cool indoors on hot days. They will thank you for it. 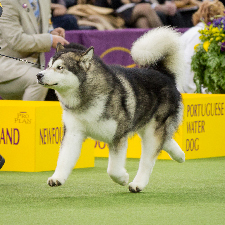 Bred to run great distances, Alaskan Malamutes are very active and need lots of exercise. They might not do so well in apartments. Ideally, they should have a big yard with a high fence. Be warned, however: These dogs like to dig. Also, if you live in the country or on a large piece of land, expect your Alaskan Malamute to roam around and patrol the borders. 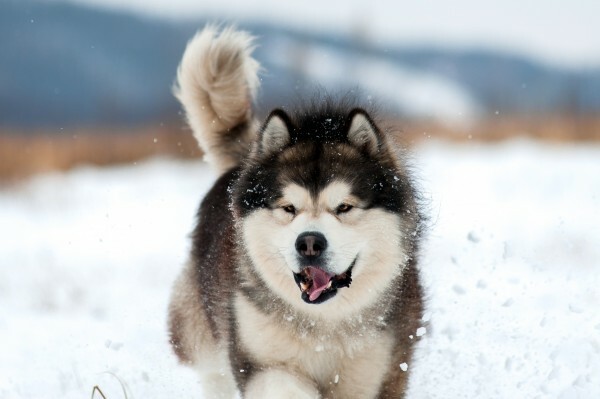 A healthy Alaskan Malamute can live as long as 15 years. Common health issues include hip dysplasia and eye problems. They are also prone to bloat: If a big bowl of food is left out for them, they will devour it. So, it’s probably a good idea to feed them small portions throughout the day. Alaskan Malamutes need daily brushing. They shed fairly heavily in the spring and fall. Alaskan Malamutes were named after the Mahlemuts—an Inuit tribe based in the northern part of Alaska. These Arctic dogs, which probably descended from the wolf, were bred to haul sleds and other gear through the snow. No one knows exactly when these dogs originated, but it’s likely that some interbreeding occurred when Europeans and other settlers brought dogs to Alaska. In the 1920s, the popularity of sled dog racing encouraged dog enthusiasts to take notice of the Malamute. Formal breeding began in 1926, and the AKC first registered the breed in 1935.